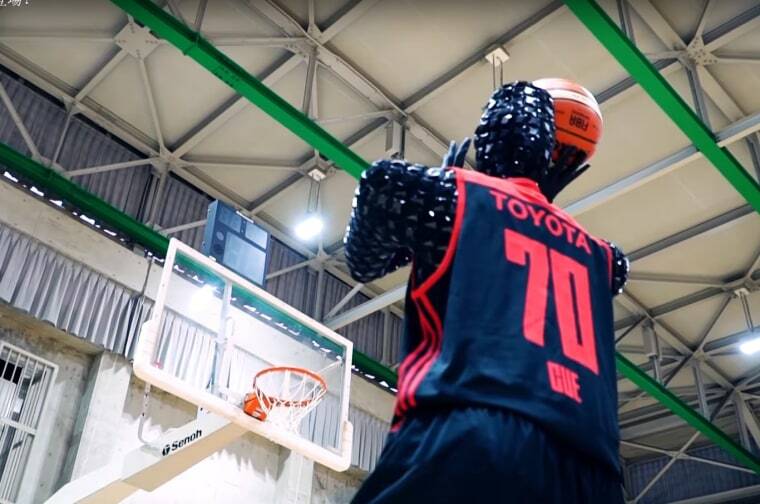 A new basketball-playing robot in Japan may not be the biggest player on the court, but it sure can shoot. Known as "CUE," the six-foot-three-inch bot sinks free throws with 100 percent accuracy — 10 out of 10 in a fun new video released on March 14 (see below). That’s way better than the current NBA average of 77 percent — and even better than the record of Stephen Curry, whose 90.3 percent career average is tops among active players in the league. CUE was created by the Toyota Engineering Society and wears #70 on the Toyota-sponsored Alvark Tokyo team in Japan. The ball-playing robot — inspired by a manga character — squats, aims, and springs upward to release the ball, just like a flesh-and-blood player. And like other players, it owes its accuracy in part to repetition. CUE practiced shooting 200,000 times, using artificial intelligence to hone its form, Japanese news outlet Asahi Shimbun reported. Though CUE is listed as a shooting guard, the bot is unlikely to get a lot of game time — at least if the video is any indication. In it, CUE doesn’t move about or even shift its feet, which are planted on a metal platform. But CUE will get another chance to show off its shooting prowess on March 28, during halftime at an Alvark Tokyo game in Tokyo. If CUE wins, the team tweeted out a challenge to go head-to-head with Curry or NBA great Shaquille O'Neal.